In its report, the Census Bureau used cost of living to determine poverty level. 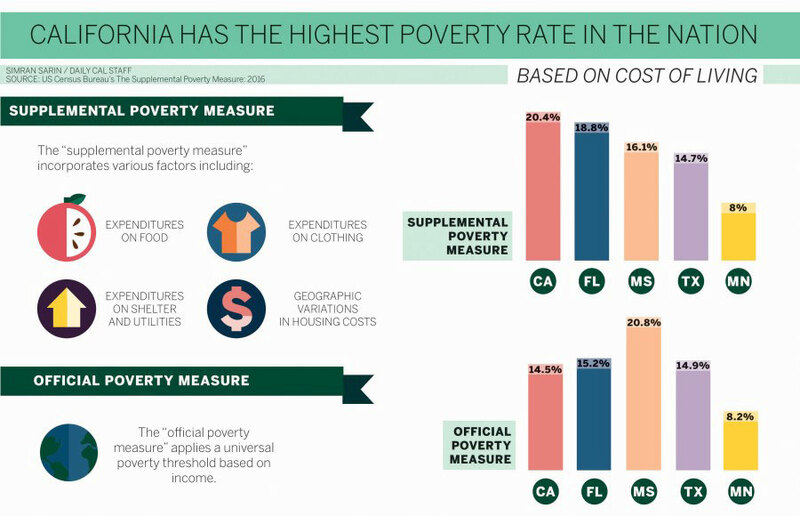 The report utilized a standard called the “supplemental poverty measure,” or SPM, which incorporates various factors including expenditures on food, clothing, shelter and utilities, as well as geographic variations, in housing costs. According to the Census Bureau, individuals are considered poor if the resources they share with others in the household are “not enough” to meet their basic needs. The Census Bureau began reporting SPM in 2011, to enhance the previously used “official poverty measure,” which applies a universal poverty threshold based on income. In other words, with the official poverty measure, the Census Bureau considers anyone earning less than a certain income impoverished, whether they live in California or Mississippi. SPM, however, takes into account that the same income cannot go as far in California as it can in other states. A little more than 20 percent of Californians — about 8 million people — live in poverty, according to the state’s SPM rate. By comparison, in Mississippi, the state with the highest poverty rate by the official poverty measure, only about 16 percent live in poverty, according to the state’s SPM. According to UC Berkeley’s Basic Needs Security Committee chair Ruben E. Canedo, the experiences of campus students living in poverty provide context for the state’s high poverty rate. Canedo also stressed the importance of supporting students living in poverty.